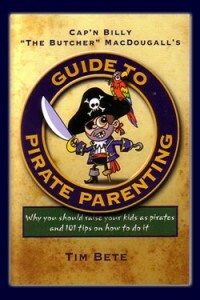 Guide to Pirate Parenting is not an actual course in how to raise your kids to be scalliwaggs. Nor is it a more generic Bill Cosby “Fatherhood” sort of book in the guise of pirates. What it is, in fact, is humor, plain and true — from its advice on feeding, raising, and caring for your young barnacles, and right up through the section on converting your minivan into a ship. I’m uncertain whether author Tim Bete would be amused or appalled were he to learn that someone was actually putting his techniques into practice, but I’m sure he wouldn’t recommend it. In parting, I would like to share my own favorite excerpt from “Cap’n Billy’s Top 10 Reasons to Raise Your Children as Pirates”, that being # 8: When other parents hear you’re raising your children as pirates, they’ll stop asking you to volunteer at school. This entry was posted in Books and tagged bete, humor, self-help by Bilgemunky. Bookmark the permalink.